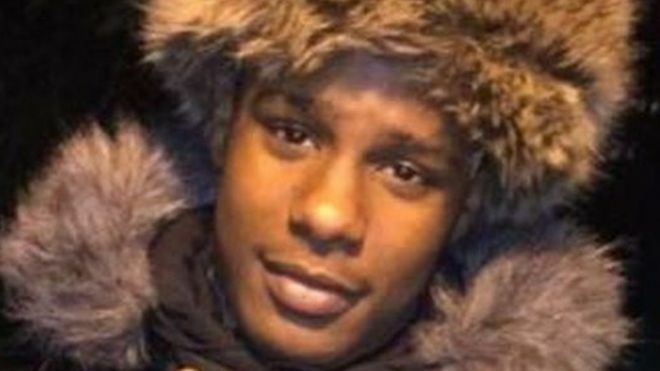 Rhyhiem Ainsworth Barton was a 17 year-old boy with is life ahead of him and he has just been shot dead in London. He was found in Warham Street, Southwark, as a result of a reported shooting in nearby Cooks Road on Saturday evening. He was hit in hail of bullets while playing football with friends and died at the scene shortly before 19:00 BST. No arrests have been made as the investigation continues. His mother Pretana Morgan said she couldn't have asked for a better son. She told reporters on the Brandon Estate that he was an aspiring architect who was trying to make a difference by learning to work with children. She said emotionally: "My son was a very handsome boy. He's got so much potential. My son's a good boy." More than 60 people have been killed in the capital this year over half were the result of stabbings. President Trump has even mentioned the crime wave in London by quoting a Doctor who said his hospital was like a warzone. In yet another attack two young boys aged 12 and 15 were shot in Wealdstone north-west London and taken to hospital. On Friday, in another unrelated matter, a cyclist was shot at in Blenheim Grove in Peckham. Three men then made off on two mopeds. Moped gangs and Acid Attacks are also plaguing the capital city. London mayor Sadiq Khan said his thoughts go out to the 'loved ones of the teenager who was tragically killed'. Do you agree the carnage must stop now and we need to get tough?